Let me first say quite clearly that I do not mean to undermine the intentions and frustrations of those who launched this campaign and, yes, when the meter goes on without asking, it eases a morning commute significantly. The question is: if this does not happen at times (and indeed it doesn’t) then why is this so and what does one do about it? There is a lot to be said about the economics of the issue itself and I welcome others reading who know more to write about it more extensively. But this piece is not about that. It is about the campaign itself and how we articulate political questions in our cities. It is fundamentally about the easy, unremarked way in which a working urban resident and citizen – who is also, after all, a “fellow Bangalorean” and concerned with “economic justice”– can be termed and portrayed a “rakshasa” as if it were a banal utterance. But, the campaign writers may rightly say: “We are not against autodrivers – it is about complaining against those that overcharge.” Does then a campaign’s representation, these words, this cartoon (ahem) really matter that much? It does. These imaginations, names, words and aesthetics alter, narrow and limit urban politics. You cannot see a rakshasa as another citizen who lives in your city. There was an alternate way to run this campaign: to sit with associations and unions of auto-drivers and come to an agreement. To find out if auto fares are reasonable, high or low. To figure out community mechanisms to prevent non-metred travel. To, if that’s what came out of the engagement, support campaigns for metre fare increases as inflation, prices and petrol/gas increase. To work out a periodic shock-absorption surcharge for periods with very high gas prices. To find out why it costs four times as much to own and register an auto than a Tata Nano. To find out what the daily rental of the auto-driver is that he is trying to make in his twelve hour shift. To figure out why his fares are regulated though the rental he pays isn’t. To consider, quite simply, the auto-driver as a person and a citizen rather than a criminal or a rakshasa. To find out how the institutions the petition is angry at have failed him just as much and, most likely, with much deeper consequences. Instead this campaign pits “concerned citizens” against “autodrivers” that are, as the image suggests, always already criminal. It repeats the mistake of multiple recent middle-class campaigns for “economic justice” and “social change.” These campaigns increasingly target a particular set of issues –for example, corruption or security – that should concern all of us but because of the way they are defined and articulated instead exclude what is a majority of our urban citizens. Where do such images come from? Let me trace just one possible thread. In another context, Leela Fernandes has argued that Indian cities are defined by a “new urban aesthetic of class purity.” She was referring to new forms of elite built environments from streets cleared of the poor, gated communities and enclosed malls, and parks where one can walk and play but not sleep and work. Yet this aesthetic doesn’t just manifest itself in the built environment – it is part of an elite urban politics that cannot imagine the poor as fellow citizens. Elite and middle-class campaigns thus become something altered– they are reduced to the protection of what Fernandes calls a “lifestyle.” Not the Right to Life, but the Right to Lifestyle. In the protection of this lifestyle, the working poor cannot exist as fellow citizens with rights and dignities. Their concerns cannot be part of the conversation. They are “rakshasas” that take resources from the state, are the sole reason for public debt, encroach on public land, burden athe government for “handouts,” and pollute and dirty the city just as they take hard-earned tax money taken away from its rightful heirs. The responses that these campaigns seek can understand “economic justice” only in the form of punitive and disciplinary punishment for the always already criminal poor. 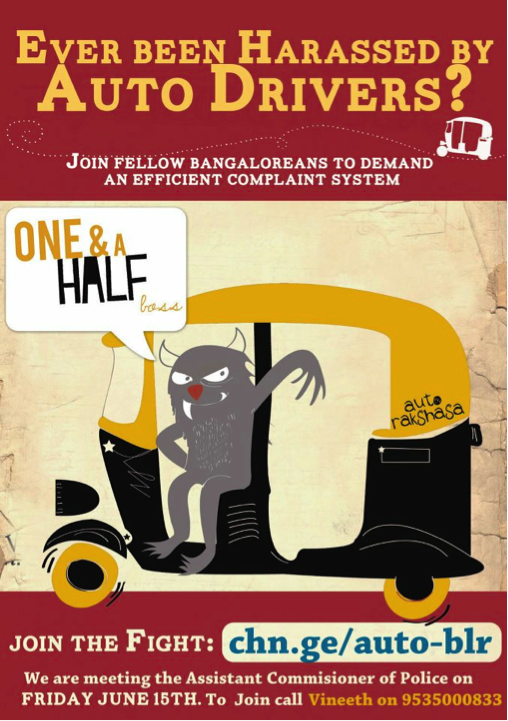 In this particular campaign, the only possible result is a deeper surveillance and harassment of auto-drivers by law enforcement – no other interaction is possible, no other solution is conceived. Herein lies the tragedy. What is this campaign fundamentally meant to be about? It is about what happens to a complaint made to a public institution about a service. It could relate then to other, larger campaigns about getting public institutions to work and be accountable to all parts of what makes our urban public. The autodriver is as interested in this question as you or I yet he is excluded, in this frame, from asking it. Worse, he is held responsible for it.